For more than twenty years I've been wandering the woods and waterways of Saratoga County, New York, looking closely, listening carefully. 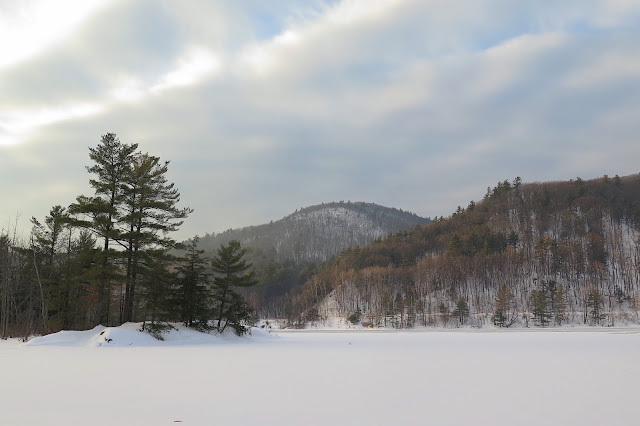 We are blessed in this county with an amazing amount of wilderness right at hand. With this blog I will share a year of adventuring here, seeking out what wonders await in my own Madagascar close to home. 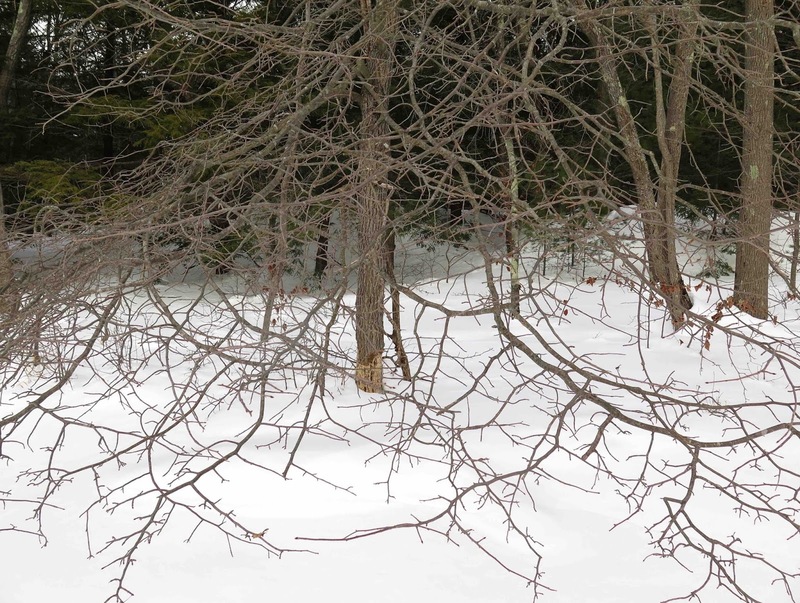 Sunday, February 3: Finally, a day that was truly pleasant for a walk in the woods! 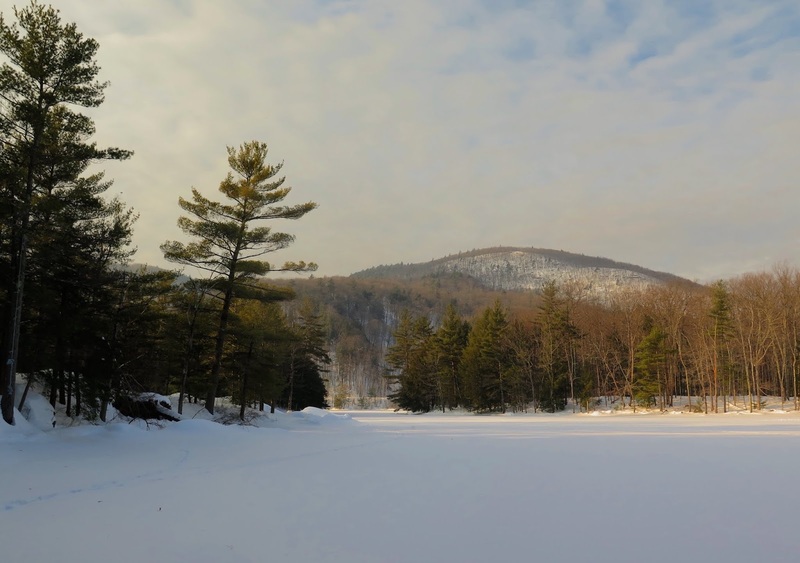 Mild temperatures, no wind, and deep, soft snow inspired me to head toward Potter Point on the Hudson River at Moreau, a beautiful stretch of forest, islands, rocky promontories, and quiet coves that lie just upstream of the Sherman Island Dam. Parking at the end of Potter Road, I strapped on my snowshoes and headed down through the woods to the banks of the river. 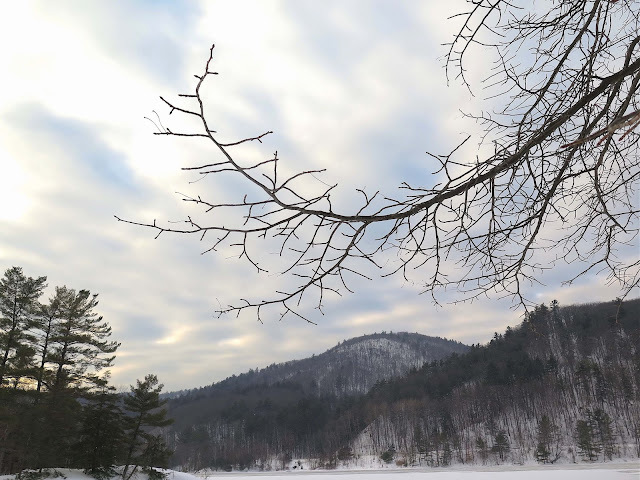 High, thin clouds let just a bit of the sun's golden light wash over the frozen expanse of the quiet backwaters, where I could hear no other sound but the croaking calls of ravens from the mountains that rise across the river. 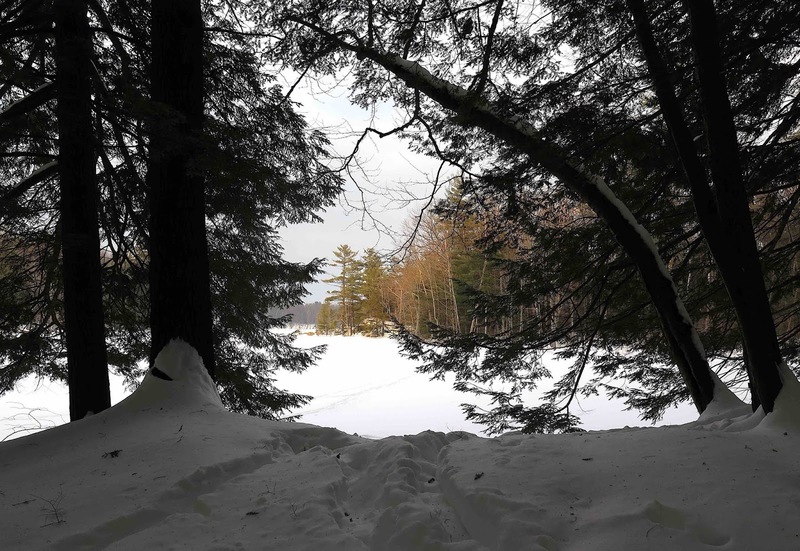 Back here in this cove, the frozen surface of the river was covered with a much thinner layer of snow than what lay in the woods. 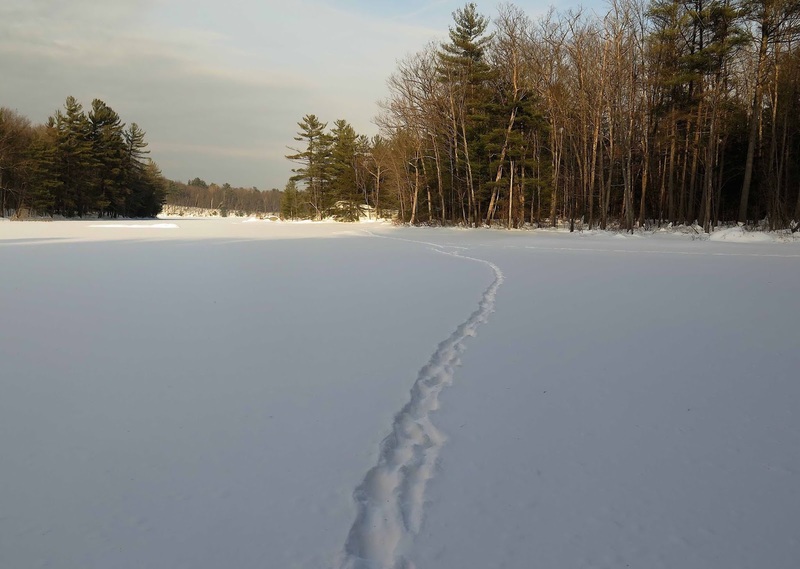 I could see from their tracks that many wild animals had saved their energy by traveling along the frozen river, rather than struggling through the deep drifts in the woods. 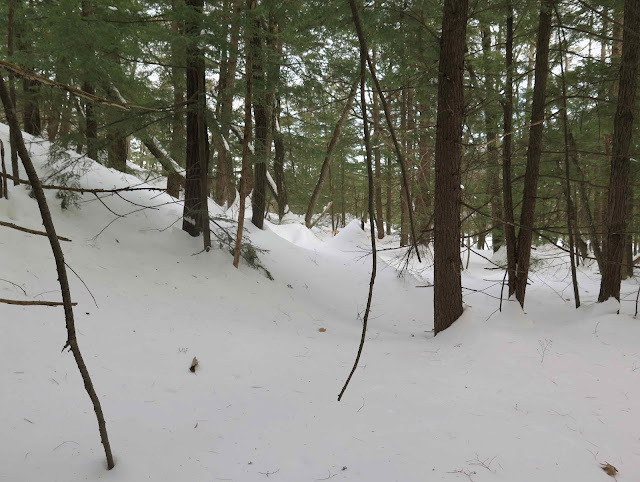 Although the prints in the trail pictured below were too obscured for positive identification, it seemed likely to me, judging from the length of the stride, that several coyotes had passed this way, and not too long ago. 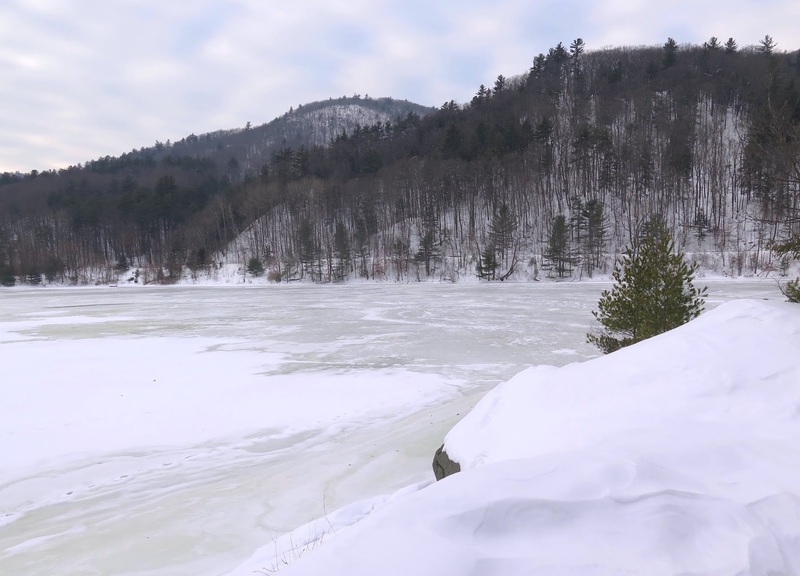 I, too, would have preferred to save my energy by walking on the ice, but I know how uncertain that ice can be, here where dam operations, as well as the river's current, can dangerously weaken the ice. So off I went through the woods, making my way through pillowy heaps of snow. 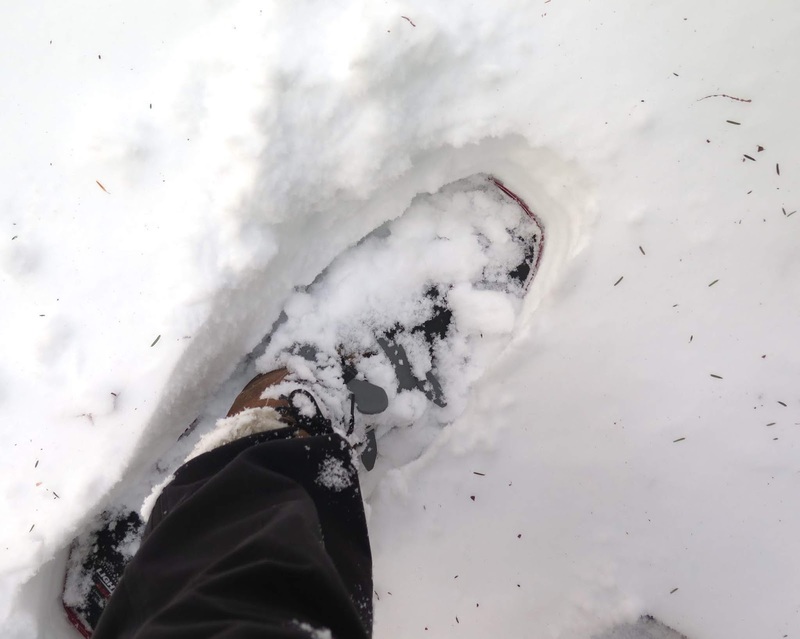 Even with snowshoes on, my feet plunged down a foot or more through the soft snow. Although the soft snow muffled the whumps of my footsteps, my huffing and puffing surely would have alerted any wildlife in the area that I was coming their way. I heard what sounded like the scream of a Bald Eagle, but I never laid my eyes on one, nor any other creature. I emerged from the woods to stand on the shore of a cove, where the river runs back between Potter Point and Three Pine Island to enter a quiet marsh. I walked out to the end of Potter Point, where I could see that even the main course of the Hudson was frozen over completely from shore to shore. I love how the rolling contours of the hills are revealed in winter, no longer hidden by the forest in full leaf. This area of the river's shore is populated with many Black Tupelo trees, whose twiggy, horizontal limbs can be immediately distinguished from those of the Red Maples and Chestnut Oaks that also line the banks. Unfortunately, beavers have girdled the bark of most of the Black Tupelos here, causing the population to dwindle. I noticed that this tree was among their latest victims. Too bad! 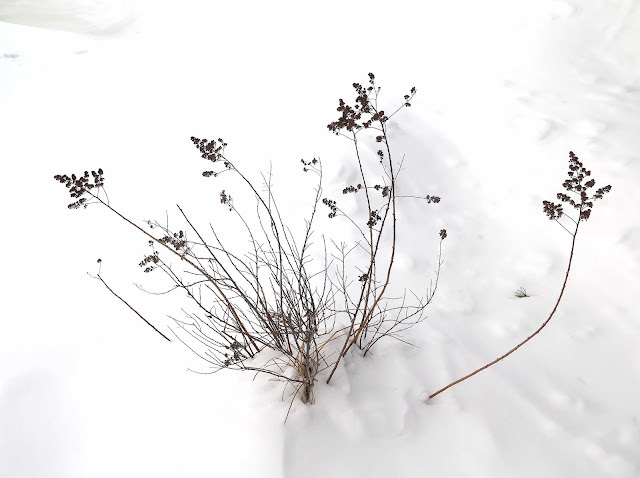 I was struck by the stark beauty of this Meadowsweet shrub, its dark seed heads arrayed like a pen-and-ink drawing against the pure white of the snow. 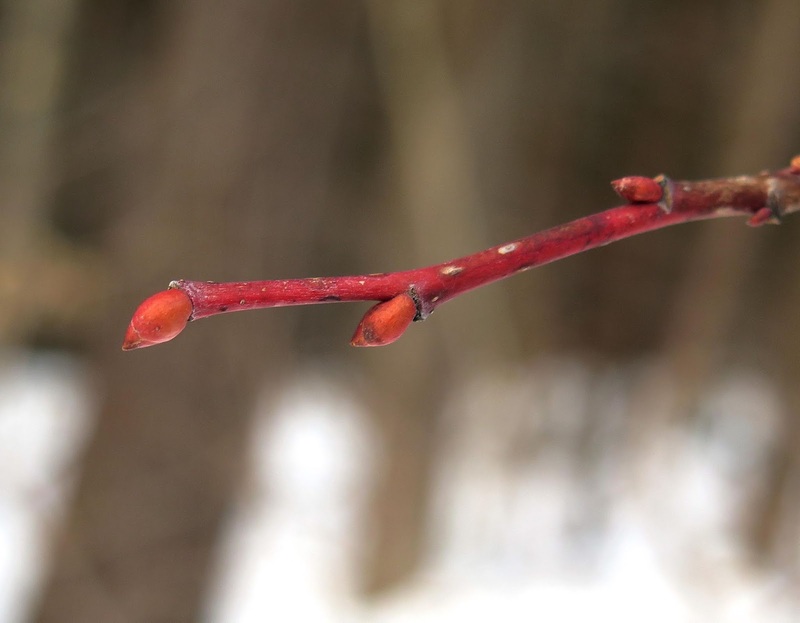 Against the otherwise muted colors of this winter landscape, the ruby-red twigs and leaf buds of an American Basswood tree certainly announced their vivid presence. Black tupelo (down here called black gum) frequently reproduces by root sprouts similar to, but not as abundantly as, beech -- so perhaps you'll still have black tupelo along the river. 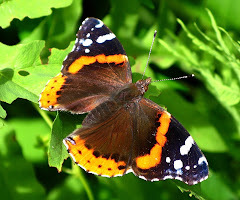 A selection of photos, using either a Canon PowerShot G7 or, more recently, a Canon PowerShot S95. 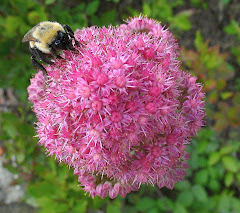 All photos and text of this blog are copyrighted by Jacqueline Donnelly. Those embedded in the text can be enlarged with a click of the mouse. The ones in this sidebar cannot. April Blizzards Bring . . .
Third Bloom of the Season! 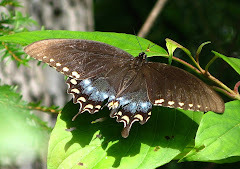 Brevity is the Soul of…Nature Writing? 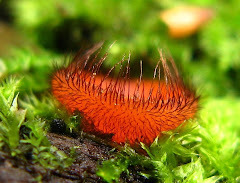 A fungus called "Dead Man's Fingers" -- or is Mickey Mouse reaching up from his grave?